Ever Wonder What Skinny People Eat for Breakfast? Do you ever wonder what skinny people eat for breakfast? Do they eat anything at all? You’re not alone. Researchers at the Cornell University Food and Brand Lab wondered about the same things so they asked. The Cornell researchers launched an online registry that asked the question: On an average day, what would you have for breakfast? The people who responded might not have been actually skinny (whatever that truly means) but they were all of a healthy weight and don’t need to do much to stay that way. Their average weight was 134 pounds. Average height was 5 feet 6 inches tall. Their ages ranged from under 25 to over 41. The entire group’s body mass index (BMI) averaged 21.7 (the healthy BMI range is 18.5 to 25). 51% wake up with fruits and vegetables. 33% enjoy cold cereal or granola. 32% breakfast on some form of bread. 31% go for the eggs. 26% drink coffee with breakfast. 63% have vegetables with dinner every evening. 61% prefer chicken over other meats. 35% choose a daily salad for lunch. 19% don’t drink alcoholic beverages. 35% don’t drink soft drinks. 24% weigh themselves every day. 25% do sometimes, but rarely. 38% exercise one to three days a week. 26% exercise six or seven days a week. Does Your Favorite Celebrity Eat Breakfast? Some do but others don’t; they’re pretty much like the rest of us but maybe a little more rich and a lot more famous. Eggs seem important to the 14 celebrities who described their breakfast habits to the Huffington Post, with egg-white omeletes with veggies being the first choice of many. 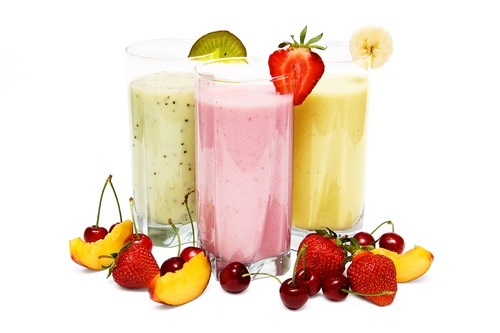 Yogurt and yogurt-based smoothies with fresh fruit are popular ways to start the day, too. Maria Menounos wakes up to Greek yogurt and blueberries. Chrissy Teigen and John Legend enjoy two eggs each with turkey bacon and avocado; Teigen drinks no coffee. Julianne Hough mixes things up, with green juices some mornings and grapefruit and scrambled egg white with asparagus on others. Shaquille O’Neal, who says he’s never had coffee in his life, starts his day with fresh-squeezed orange juice and an egg-white omelet. Kelly Osbourne says breakfast is actually the key to maintaining her now-svelte figure. she likes two egg whites with low-fat cheese or Raisin Bran cereal with low-fat milk. Carly Rae Jepson eats the same thing every day: vanilla yogurt with fruit and granola (with a couple of boiled eggs thrown in every now and then). Justin Timberlake seems to out-breakfast them all, with two breakfasts each morning: a scrambled egg and waffles with flax and almond butter before his daily workout then another egg or protein shake after working up a good healthy sweat. Why does he do this? “I mostly workout so I can eat religiously,” he explained. Vuorinen, Anna-Leena, Camille Finn, and Brian Wansink. "Breakfast Preferences of Healthy Weight People." Cornell University Food and Brand Lab / Slim by Design Registry. Cornell University, 4 Nov. 2015. Web. 13 Nov. 2015. "Healthy Breakfast Ideas: What 14 Celebrities Eat In The Morning." HuffPost Healthy Living. TheHuffingtonPost.com, Inc., 18 May 2015. Web. 13 Nov. 2015.